TIS me again, medium, mother of 2, sister, daughter, lover of nature including sunrises and tall tree’s, avid carefree dancer, vegetarian cook, changer of plans, (I now can blame it on my 5s ) loyal friend but hopeless appointment keeper. Plans change. I love my friends with fiery passion and fierce loyalty! If you’re family AND a Friend, I love you double. Believe me, I have given my all, trusted people I considered friends and been severely side swiped, shaken but unbroken. I am grateful for it all, true friends and not so true friends. I’ve needed to experience every aspect of this human situation and for that I am eternally grateful. I have learned such valuable lessons, hard ones, lessons of the heart, of trust and vulnerability. With another year approaching (2019) I am pondering my next challenge. You know a gypsy can’t keep still for long. And another year makes me question once again, where I am at ….and … where do I want to BE? What is that One / Two things that I can’t live without experiencing MORE OF? I am a carer, I work with people who are close to the end of their lives. I can tell you one thing I’ve learned this year, the accumulation of Money (although yes great and necessary to have) matters little in the end. Facing the inevitable, quietly, they realise all their worldly possessions, the expensive paintings on the walls…. they cannot take A thing with them on the next part of the journey, It seems so obvious, yet for most of us we still accumulate ‘stuff’ and have a hard time shedding what we no longer need. So I pose this question to you, the same question I ask myself at this time of the year…. “Are you going to slide into another year without questioning, happy to acquiesce and settle, not realising nor accepting that your fullest shiniest potential is still at arms length…? AND as you sigh deeply, realising that in order to get there you MUST let go...as your mind protests ‘hey, now hang on a minute… who are you to tell me I have to let go of the known, the comfortable, in order to reach for the stars? Why can’t I sit here enjoying my comfort zone while I sort of reach hap-hazedly for the stars? Why CANT I have my bloody cake and eat it too ? So my challenge is this : I crave more medium experiences, to help even more souls to connect with the spirit realm. It’s scary but there is no challenge if it’s not scary! Standing up, speaking up, being vulnerable and connecting with the magical realm of the spirit world but this is the realm that ignights my soul and stretches my vision. It gives my life such a rich purpose and I truly love it from the inside out. We stay humble and open …. to our highest calling and inner pilot light – our truth. I met with friends today. We talked about all things mediumship. Past experiences. The unexplained. One asked how many times we have actually SEEN spirit. I replied ‘twice’ in the sense of seeing with my own physical eyes. It was in a particular house where I lived, as I sat on a lounge something caught my eye, as I turned to look, this spirit woman slid into the door. Just like that. Another time she stood in her long old fashioned dress in the kitchen. One night my son stayed over, he was up late in the study and the next day said ‘a woman walked by last night – I thought it was you, but when I got up to investigate, you were in bed asleep.’ He had seen her too. I will share something else, I dreamed of my sister in law last night. Kerryn. Dreams are another way spirit beings can touch us because we are more relaxed in the sleep state and it is somewhat easier for them to make contact. In my dream she was smiling, relaxed and we spoke about being at school together, many moons ago. I last saw her a couple of years ago and felt intuitively she would be passing over around Easter…. (which was about 4 months away at the time). I have felt her essence from time to time and imagine my surprise when one of my class mates in circle bought her thru. As I sat nodding confirmation at the evidence of her, I suddenly realised they shared the same NAME! Spirit have an uncanny sense of humour at times! This is why I love being in a medium circle, we not only have an opportunity to connect with our loved ones who have passed, but its also through the connection to our deeper selves, our higher spiritual self which leaves my mind stilled and my spirit touched. Mediumship is a constant invitation of trusting our own unfoldment. I tried to explain recently to the caretaker who I briefly chatted to and whom asked me ‘what do you get out of coming here?’ I wasn’t sure he would understand the intricacies of mediumship so instead I replied ‘peace’. I said ‘It is the one time of the week that I put aside to still my mind and connect with my inner self which is divine, strong, invisible.’ There are more layers to it than that, but in a nutshell, this is what I love about meeting with like minded souls, we sit together in peace and in awe of the spirits whom draw close, wanting to be known, their love rekindled, in our precious lives. Seeing that spirit woman all those years ago led me onto a pathway of learning about why we are here, where do we go when we pass over and how come I saw this woman? It is an ongoing journey which never ceases to amaze me, which is humbling and keeps me open to life’s constant little surprises…. There has been one area that I’ve struggled and questioned over the years which seem to be opposing one another. Depending on which camp you come from or believe. One school of thought (mind driven) will tell you ‘if you don’t know where you’re going you’ll end up there’ and adamant about goal setting, self purpose and self direction. The other is the way of the spirit, which if you are familiar with, will tell you to relax, get out of the way, allow yourself to be guided and that everything happens for our greater good. Since we have no earthly way of knowing what that greater good truly embodies, we need to become receptive and to calm the mind which has a million questions. Silver Birch teaches that when we begin to feel anxious we set up a vibration around us where by the spirit world cannot reach us. If we stay calm, they can guide us, a book will fall off the shelf, we will turn on the radio just in time to hear something we’ve been asking about, we are more aware and alert to our signs. This is the manner which I have been becoming more adept at, its a sort of living more intuitively. During times when Ive travelled with only a mud-map, I have become in tune with such guidance. The challenge is in day to day life, in a world which is screaming at us for our attention, what will we give our time to? How will we stay in a state of calm? What do we do daily to achieve this? Is there a way to combine both of these factors, to use goal setting without feeling like we have failed if we don’t reach it? Curious to hear your feedback. Some of you have probably read my other posts about my beloved brother who is in the spirit world and how he often comes through to me. Our ‘sign’ is a seahorse, which I’ve written about before. This morning, I climbed out of bed and decided to walk to the local coffee shop to buy a take away coffee. This is not something I normally ever do…. As the young woman handed me my coffee she said ‘I’ve put it into a second cup because it’s quite hot’… I thanked her and as I walked outside I realised the ‘other cup’ had a pattern of sea horses. I smiled and mentally acknowledged my brother. A couple of hours later, I suddenly saw the date and realised it was actually my brothers birthday! Holy moly, how could I forget? I texted my sister reminding her, as she too had forgotten. This is just a little story to remind us all that our loved ones are never far away, they use ‘signs’ to get thru to us and to show how we are guided and to reassure us that they are really and truly okay. Readings and what to expect …. My friend was incensed. As I drove her home she told me in no uncertain terms what a waste of time it was taking her to see this woman and that she should ask for her money back! I drove her home in silence, wondering how this psychic could have gotten it so wrong? So…. knowing there is no ‘time ‘in spirit world as such, I decided to wait it out. I did wonder, what responsibility we have to our own intuitions, being truthful and yet being so careful to whom we are reading for…. I always err on the side of leaving the recipient empowered and feeling positive about their lives, but, in this psychics case, maybe she needed to be blunt. I wasn’t so sure at the time. 18 months down the track. The above relationship begins dissolving before my eyes and my friend rings me in tears. I try to offer support (aware that advice is often NOT useful during such times) and become a shoulder for her to cry upon. HOWEVER never one moment did I forget what this psychic had predicated from her ‘promise ring’…. I didn’t have the nerve to remind my beloved friend (unless I wanted a black eye) so I kept the revelation to myself and decided to write a blog about it instead! So….. months down the track, the break up was horrendous, no other word to describe it. My friend was in a bad way for a while. Yet, ever so slowly, she began to come around, to heal and began to enjoy life as a single girl again. She lost weight, attended the gym and began to be reacquainted with experiences she wasn’t able to do ‘with the ex’…. I applauded her from the sidelines the whole damn messy way. And I believe, that is what the spirit people around us do also, they applaud our advances but never judge our mishaps. They are always close to lend a ‘spirit hand’ in times when we feel we are at our wits end. They are there ‘yet not there’ so to speak. Never lose hope. Even when some *truth* as it turns out reveals itself, know that you are on your pathway to greatness, whatever that may be, however small or great that is, what is ‘great’ to humans is rather ‘small’ to the spirit world so try not to judge anything – it doesn’t matter! The thing is, we are growing evolving souls learning so much about relating to others, sharing, caring and showing compassion when it’s easier to turn away. We are never truly alone. Even if we feel we are. We are not. Many years ago, I was asking my brother for a sign from the spirit world that he was still around. It had been a few years since I’d had an amazing initial contact, one of which was the time I saw Doris Stokes. A decade along, things had been pretty quiet, so I reached out for him once again, asking for a sign. Before he had died, he had worked as a fisherman and found a tiny seahorse caught in the nets. He had it gold plated for his girlfriend. I thought the seahorse was a pretty good sign, yet I kept this to myself. One day shortly after, I was walking on a beach near Newcastle in early 2002 with a friend who did aura photography. He looked at me and said ‘I’m just going to take a walk up here’ and off he went, wandering among the sand dunes. About 10 minutes later we caught up again and he said to me ‘close your eyes I have a surprise for you’. I closed my eyes, and when I opened them he had placed in my hands a large seahorse about a foot long! I couldn’t believe my eyes!! What were the chances of that happening? I jumped for joy and then relayed to him the story of my brother and how I’d been asking for a sign. This was no ordinary sign to me, it was a massive significant one! After that, I literally bumped into seahorses, patterns on towels, signs on cars, plaques on the walls of gift shops everywhere I went. When I was in Monaco, I decided to visit the Jacque Cousteu museum. I paid my fare and excitedly walked in, took some stairs down into a darkened room and the very first aquarium I came to was filled with seahorses. I literally stood there and cried, mesmerised by their eloquent beauty and thanking my brother for the guidance. So when my mum passed over, I thought our sign would be a red rose, as that was her favourite flower and colour. Yet, nearly every time, I am speaking about my mother, a large butterfly will cross my path. Recently I was on the phone to a friend who asked me ‘so how old are you this year?’ I literally said ‘God knows how I got to be this age! I’m nearly 58!’ when a massive butterfly came out of nowhere and flew directly at my face! Another day I was waiting for my sister to arrive and decided to sit outside in the winter sunshine. I sat for about 10 minutes when suddenly a butterfly appeared, fluttering her wings and sat beside me on a blade of grass. I was watching it with the curiosity of a child and right at that moment my sister’s car pulled into the driveway. I have friends who would pass this off as pure co-incidence. Fair enough. That is their journey and opinion. It has happened too many times for me to pass it off as inconsequential. I view it as the world of spirit sharing, coming close to us in the only way they can via other creatures… They come in on signs hoping that we will notice them. It gives us the opportunity to pause, reflect, smile and say hi. Notice your signs. Recently I went away for a couple of days of prayer, peace and mediation. Entering the silence is a sacred thing I’ve recently enjoyed doing. I used to be busy all the time, always on the go, but lately, slowly I realise the need for quietude and reflectiveness. In fact, it is now becoming a pre requisite. Time for my soul and spirit, guilt free indulgence. Anyway, on the second day there, I decided to go get a book from the communal bookshelf. As I picked one at random I smiled when I realised who the author was. Ram Das. Haven’t seen his name for about 40 years, loved his other book Be Here Now. So, I held his book in my hands, said a prayer and selected a page at random. Imagine my surprise when my eyes gazed on the third line…. and read the name ‘Leary’. My brother (Mick, who is in spirit world) surname is Leary! I couldn’t believe it. What are the chances that I would select a book at random, turn to a page at random and there is my brothers surname staring at me !! I began to chuckle. How intelligent is the spirit realm. This was no co-incidence. ‘Why is he coming through?’ Oh wait a minute, it’s APRIL…. His anniversary.. I quickly grab my calendar to check the date and yep, sure enough, in a few days Wow. 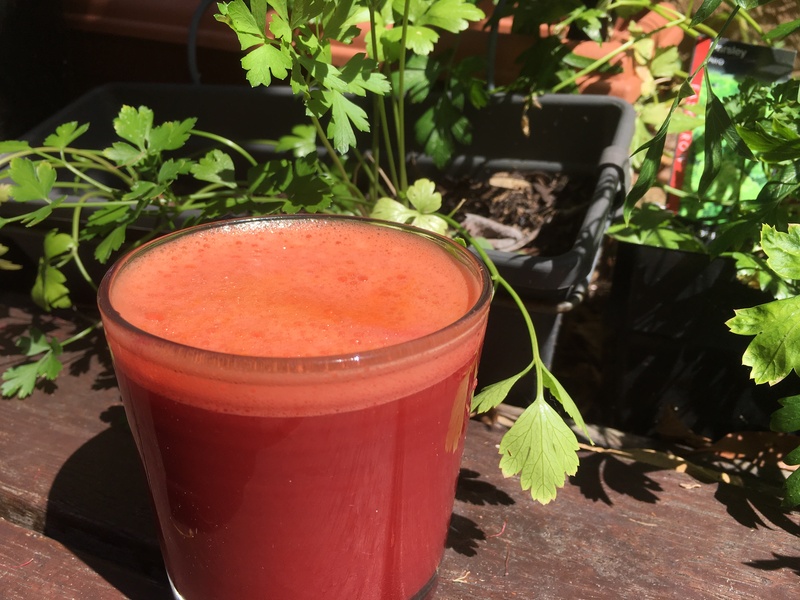 I am beginning to love juice fasting. The feeling of clarity after those first days, the shape of your belly shrinking and wonderful deep sleeps at night. Yet there’s no pain without gain right? And I need to be brutally honest. Hunger pangs, headaches and persistent mental fog for the first days may have questioning ‘what have I done?’ No where on this planet is it more true than the saying ‘mind over matter’. For many people going without food is something they truly feel they can’t do, but I say challenge that thought. Even if only for one 24 hour period, give it a try. It is a start and maybe next time you will manage a 3, 5 or 7 day cleanse. Believe me, the benefits outweigh the initial discomfort. So instead of hot cross buns, chocolate eggs and partying with friends, I chose to slow things down (meaning I stay indoors on day one so I’m not tempted to break the fast). You need to be prepared! There’s a bundle of fresh veggies to buy, a dozen litres of filtered water and the main fruits I add are green apples and watermelon. There is a lot of conflicting information out there. I’ve had friends look at me in horror and say ‘not watermelon – its full of sugar!’ Yet when I researched it, watermelon is in the lower 10 sugar fruits – strawberries were the lowest, and red apples in the higher range which is why I choose green apples. I also have fresh ginger and plenty of lemons on hand. This cleanse we have decided to add a soup broth to also sip on, the flavour is different and the warmth makes you feel like your devouring something wholesome. Why juice cleanse? Basically, to give your digestive system a rest. Our bodies work tirelessly day in and day out. By avoiding roughage for a period time your body can get to work cleansing and healing from the inside (if it’s not spending its energy digesting). By day 4 – 5 you will honestly feel incredible. The tricky part it, you have to get through days 1 – 3 in order to begin reaping the benefits. The benefits are: weight loss, sparkling skin and eyes and oh la la energy plus. I can’t tell you (yet) if I’ve lowered my cholesterol because I’ll need a blood test, but my daughter’s triglycerides dropped from 7.8 to 2 after our last 7 day juice cleanse! Look, it’s pretty hard to do juice cleansing alone, so much easier if you have a pal to walk the journey with. We spend those first couple of days complaining about our headaches and it’s so good to flop into bed when you need to. On the up side, we are there to encourage each other when one wants to cave into a food craving. Believe me, you will reap some amazing rewards and feel incredible at the end of it, so much so, that I’m committed to doing a cleanse every 2 – 3 months.